Recently I told a friend, “You’re going to think I’m joking, but I’m not. I got a tattoo.” Despite my warning, she thought I was joking. Maybe you’re waiting for the punch line too… but there isn’t one. I got a tattoo. I’ve shared my reasons with my nearest and dearest and decided I wanted to write an explanation that I could point people to as needed. Really, I don’t owe an explanation to anyone, but sharing the reasons I got my tattoo is part of the reason I got it (that makes sense, right?). There aren’t many facts about me or my life that are secret– I’m not a very private person– but perhaps the depths of some of the facts are. It’s not secret that depression has been an issue for me, but I’ve painted a far rosier picture than reality, even for my sweet hubby and, really, even for myself. Like Impressionism vs. Realism. The depth of it, the reality of it starts with “attempted” and ends with… well… it didn’t. Could’ve ended. Almost ended. But didn’t. Let’s have an aside for a moment. First, please excuse my vagueries. It makes a difficult subject, a difficult confession a little easier. I feel exposed enough. Forgive me hiding behind turns of phrase. Second, if you know me and you’re reading this and feeling like you should’ve known, like I should’ve told you… you might be right. Maybe I should’ve. But that’s the nature of the thing, isn’t it? It lives in the dark, flourishes in the dark and withers in the light. Like any other thing with a mind of its own, it has a sense of self-preservation. And so I didn’t tell you because it wouldn’t let me. And in those moments when it didn’t have a grip on me, I suppose I was embarrassed & ashamed. For that matter, I am embarrassed and ashamed now… but I’m learning not to be. I’m determined not to be. I have never felt like my depression was the haywire-brain-chemistry kind and medication isn’t my thing anyway. My depression has always been due to ugly self-talk from a vicious inner-bully (IB) who, like a skilled gardener, thrives off of as well as feeds my poor self-care habits. But I have been unable to stop the barrage… until recently. 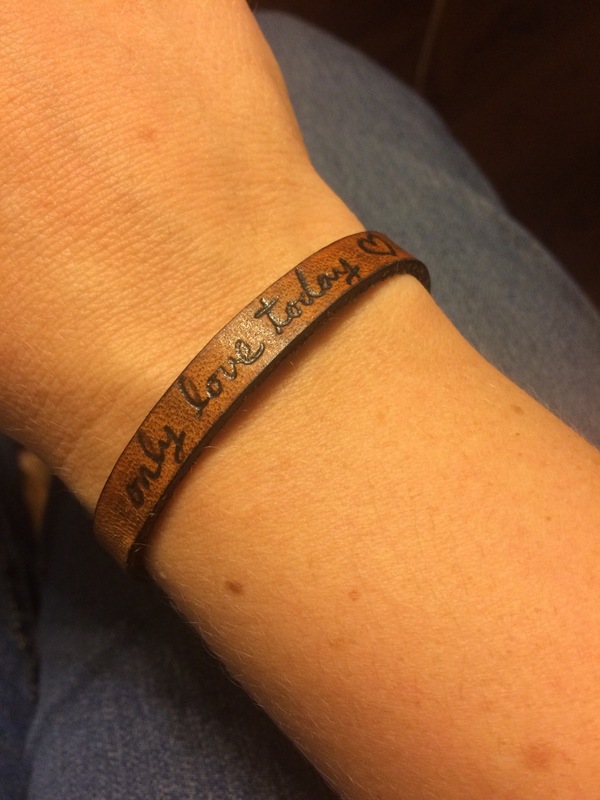 A while ago, I came across the phrase “only love today” on a blog called Hands Free Mama. At first, in my literalist, perfectionist mind, I balked at the phrase as an impossibility, but earlier this year, I guess I was desperate. It seemed like depressive episodes were coming more often and hitting harder. One incident really worried me. Whenever other people (besides my husband and kids) are around, I’ve never found it hard to shut down IB, be genuinely happy and enjoy my friends and family (it’s one of the things that tells me mine isn’t a clinical depression). But this was different. Thoughtful friends had gifted us with a photography session and the photographer wanted to come to the house. To my very messy house. She was going to be looking for a place to photograph the kids… inside my very messy house. I cannot explain the level of panic that set in. It is no exaggeration to say that I was non-functional. I could.not.stop.crying. Bawling. Crying so hard I couldn’t catch my breath. That had never happened before. When it came down to the wire, I could always at least fake a smile. But not this time. In a moment of strength, I texted a friend who had also dealt with depression and explained my situation. She offered to come over, and in a moment of superhuman strength, I hushed IB long enough to accept her kind offer. The day worked out, the pictures are lovely (and were taken outside! ), but I was scared. It was as though my depression had entered another stage. Like cancer gone from stage three to stage four. So I decided to try this “only love today” thing as a way to quiet IB. It worked pretty well, actually. So well that on a self-indulgent whim, I bought a bracelet off the Hands Free Mama site. When it came, I started wearing it nearly constantly. It worked better than I’d have ever thought possible, and soon it was almost a good luck charm or talisman. I would see the bracelet out of the corner of my eye and automatically read it, check my inner monologue and nearly always find that IB was whispering ugliness and spreading gangrene. But the words were right there and I would say the simple phrase to myself… “Stop. Only love today…” And as if a spell had been cast, IB would hush. Most of the time, anyway. The bracelet had one flaw: impermanence. On days when I forgot it after dishwashing or showering, I didn’t have the reminder I needed. And a time or two, IB was too strong and took it off so as to reign supreme. Overall, though, the difference was astounding. Meanwhile, I came across something else interesting and powerful: “Project Semicolon.” The tagline is “A semicolon is used when an author could’ve chosen to end their sentence, but chose not to. The author is you and the sentence is your life.” Honestly, I don’t know much about this movement beyond the tagline, so I wouldn’t say I’m one of them, but what an idea! I think what they’ve done is clever, simple and elegant. They’ve turned a basic punctuation mark into a symbol imbued with hope and victory. 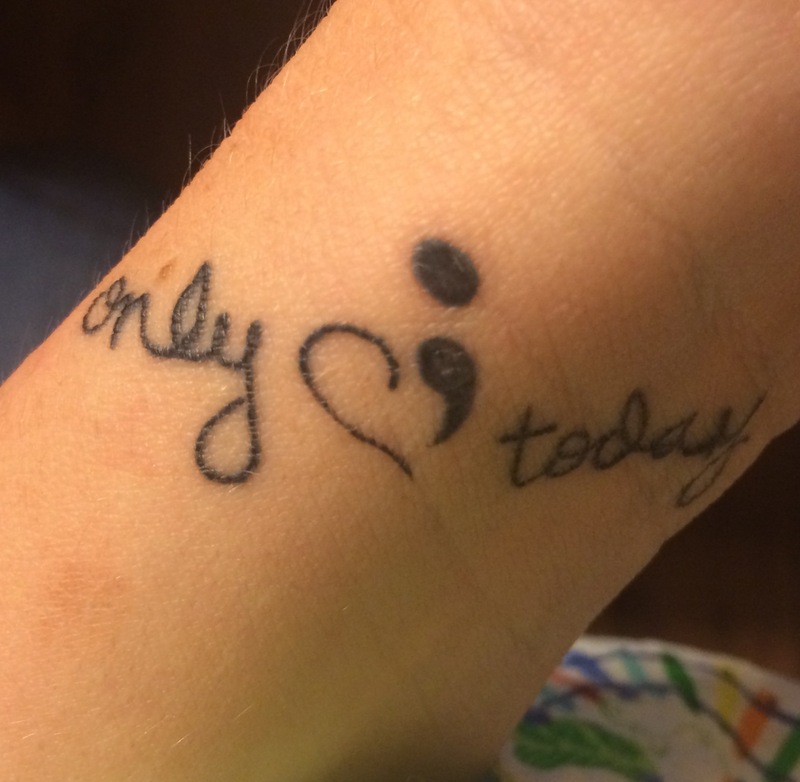 A quick google search will turn up tattoo after tattoo people have gotten of semicolons in support of depression/suicide/mental illness awareness. I wanted one too. “But I couldn’t,” I thought to myself. “What would people say?” And that’s when I recognized IB’s philosophy: what other people think of you is most important. I could. And I could fix my bracelet’s flaw as well. Soon I was doodling designs, researching tattoo shops, first tattoo tips, and asking a few trusted, godly friends if they thought it was a good idea or not. Almost universally, as soon as I explained what I wanted and my reasoning, my friends agreed with me… this could be a really powerful tool. Everyone cautioned against haste and Jeremy asked me to draw my design on my wrist for a while to see if I really did want to make such a permanent mark. He’s a wise man and his request made me all the more attached to the idea. So… three weeks ago, on a Tuesday night, I drove to AJ’s Ink in Stephenville and got inked (which is how we tattooed people say it. I guess. Haha!). It’s much larger than I had planned. The tattoo artist advised me that the way I had it planned, the ink would run together and it wouldn’t be clear. It had to be bigger. Made me nervous and I almost backed out. But I’m so glad I didn’t because it has been the tool I’d hoped it would be, and more. … in my handwriting… because it’s MY declaration. My declaration of so much. The semicolon part of my tattoo is a permanent declaration, a promise, a vow to myself and any who might see it that a voluntary end is off the table. Non-negotiable. It’s a promise to keep fighting and it’s an identifier for anyone who might know what the semicolon stands for that they– that we– are not alone. The “only love today” part is both goal and reminder. It is a goal to be loving toward myself both in my head and in my actions. Love is an active thing, and it reminds me that I must take care of myself. It is a reminder of my goal to let love rule my interactions with others. It is a reminder not to let things penetrate my heart that don’t come from love; the things that people say aren’t always born of love. The way the tattoo is designed, it also reads “only today,” and it reminds me that today is all I need to worry about. That’s what I’d expected and planned though. What I didn’t expect was the feeling of freedom I had the morning after I got my tattoo. I think that’s when I finally grasped how dark things had really been. I hadn’t realized how very afraid I had been, how scared of myself I had felt… until I wasn’t any more. I was Dr. Jekyll freed of Mr. Hyde. 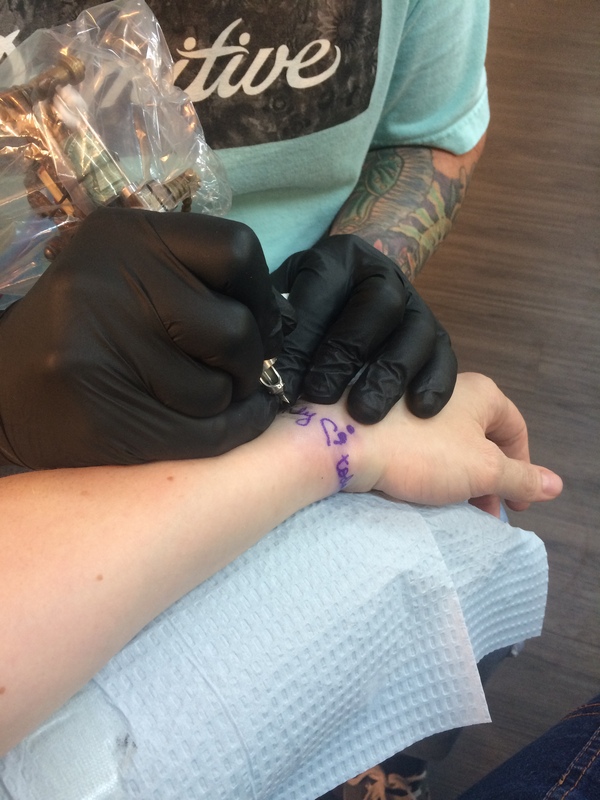 Of course, depression isn’t solved so easily as getting a tattoo on your wrist. It’s a process. Sometimes a long process. It has been long for me, but I’m so pleased… so VERY pleased… to be where I am and I feel like I’ve taken such a leap forward. I rather doubt others will notice; this has been such a private struggle. But I notice. And it bears repeating… I am so VERY pleased. And while I am still embarrassed and a bit ashamed… I’m so pleased to share this with you. Joy is best shared. Erynn, I absolutely love your tattoo and you! When you first handed me the paper with this website at the aquarium, I was afraid I had asked the wrong question about your tattoo. Reading this gave me chills, tears, and a comforting feeling all in one go. I have also struggled with depression and suicidal tendencies for a very very long time. It’s never easy to talk about. I respect you for writing this, and I feel so honored that you chose to share your story and your tattoo. Your ink contains some strong words- enough to grab my attention. I was surprised to learn that the script was in your own handwriting. It’s what caused me to ask about the entire tattoo; handwriting is such a unique and elegant thing. Sometimes I meet others who have experienced the heaviness of depression on their hearts, and it’s always comforting to find that you aren’t alone in that fight. I am very glad I got to meet you today. My only regret is that I didn’t share my tattoos with you! Feel free to email me if you wish. I’ve learned we all have inner bullies (I’m stealing that term). It came as somewhat of a surprise to me after I taught about it, and the girl I would deem the happiest go-lucky type in the room to proclaim the next week that she noticed I was right when she listened to herself during the week. I guess I would put you in that category as well (my happy-go-lucky friend). Me, on the other hand, am even more hard on myself than I appear to others. I appreciate a quote from a book that I read recently: “We spend too much time listening to ourselves, and not enough time talking to ourselves.” Of course, he was referring to telling ourselves the truth. I see our IB as Satan and his bunch of lies. Anyway, as I have learned not to judge parenting techniques (I usually say, ‘Hey, whatever works you to His glory!’), I think the same about your tattoo. Love you! I was just recently reading about the semicolon tattoos. Very interesting. If that’s what it takes for you to remember that you’re the one writing your story and that an untimely, self-induced end leaves those left behind changed completely and forever, then I’m all for it. Thank you so much for sharing that, although as you said, you owe no explanation to anyone. I think sometimes we as Christians can fall into the trap of caring more of what men think than of what God thinks. I’m happy for you that you have found something that helps you get through your days without allowing your inner bully to pull you down. And although I have never experienced depression as you have explained it in your life, I am always here for you sister if you need an ear. Thanks again for sharing. Love you.